Condition: Good. Light reading creases to the spine which is also faded, rubbed at the extremities. Pages lightly age-tanned. From the covers: “A Study of the Nuclear Arms Race. In the belief that nuclear war is not inevitable, this book presents a major new analysis of the arms race - its history and technology, its politics and its misleading political catch-phrases 'nuclear deterrent', 'Soviet threat' and so on. 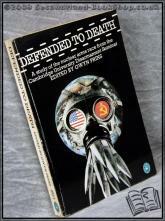 It puts forward one of the most practical and persuasive arguments yet in favour of nuclear disarmament in Britain.” 9pp. Publishers advertisements to the rear. Jacket designed by Peter Kennard (Photo.). Size: B Format (7¾" x 5¼"). 387 pages.